Flags were, historically, the sole method of communication for vessels at sea. Over the years rules and regulations have developed to manage how and where flags should be used. As a matter of courtesy, it is appropriate to fly the flag of a foreign nation on your boat when you enter and operate on its waters. The courtesy flag, as it is called, is hoisted only after the appropriate authorities have granted clearance. Until clearance is obtained, a boat must fly the yellow quarantine flag. It is also considered common courtesy to fly the national flag(s) of your guest(s) on board, if they have a different nationality than the ensign the boat is showing. Bequia has its own flag but is part of the country of Saint Vincent and the Grenadines. 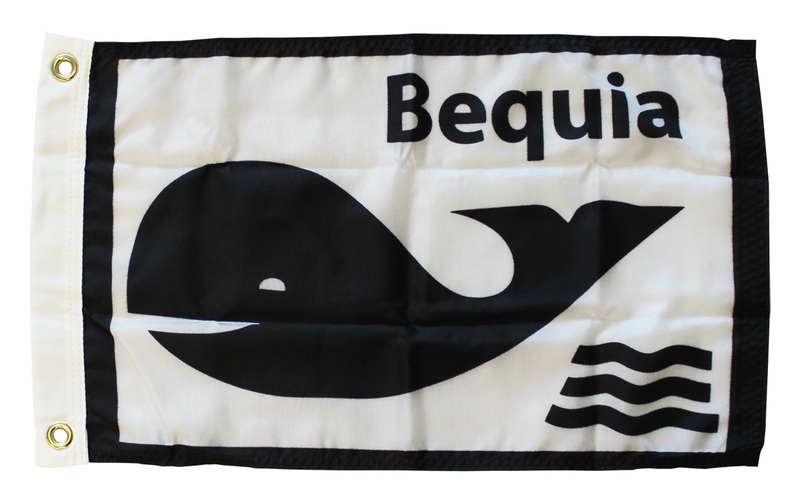 Made of high quality weather-treated nylon, these Bequia flags sport a canvas header with brass grommets - perfect for any marine use. Sizes are approximate due to hand hemming and can vary by .5"-1"